Set in the Wild West, Showdown Saloon takes you to a smoky poker room where local cowboys congregate to play Texas Holdem. With poker chips, bullets and playing cards spread across the backdrop, you’ll soon adapt to this old-school gambling environment. This 5-reel slot is one of Microgaming’s latest creations and has 15 pay-lines on offer. 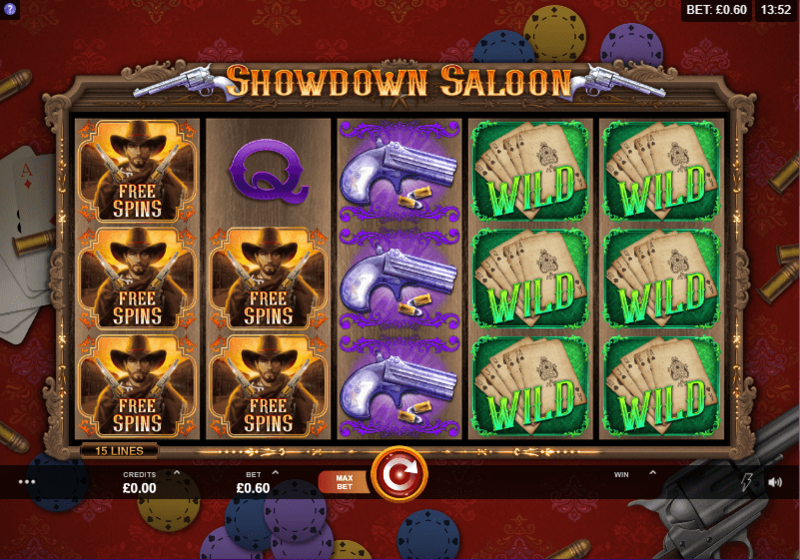 Showdown Saloon comes into its own when you trigger one of the many bonus features, including Mystery Stacks, Re-spins Feature and Free Spins Feature. Begin your duel with Showdown Saloon to see who comes out on top. There are lots of games to choose from. View these new slots online on Wizard Slots. Visually, Showdown Saloon takes inspiration from a classic poker game in the Wild West where cowboys put their drinks and pistol on the table and play for fortunes. In this instance, you’ll be the one competing against the reels for some great cash prizes. Obviously, the bonus features of best online slots such as this one should not be missed! The classic Western music greets you as you enter the 5x3 gameboard. Determining the symbol values and pay tables is easy due to the simplicity of the game. The gameboard is filled with various lower value symbols that will make up the majority of your wins, including playing card icons from ten to ace. 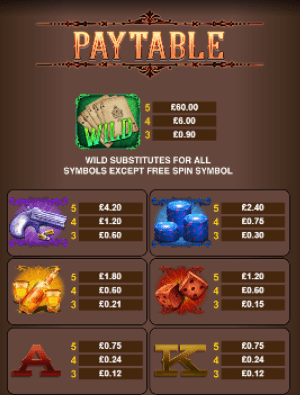 Discover the dice, whiskey, poker chips, pistol and playing card WILDS for higher cash prizes. MYSTERY STACKS – Every reel in the base game and Free Spins Feature has a stack of mystery symbols. A single game symbol will replace the stack of mystery symbols on each reel. For every base game spin, the same symbol will replace the two leftmost Mystery Stacks. The remaining Mystery Stacks will be replaced by different symbols. During the base game, Free Spin SCATTERS can replace the mystery symbols. RE-SPINS FEATURE – By matching full symbol stacks, you can trigger the Re-Spin Feature. Matching full symbol stacks must land on two to four reels. During the Re-Spins Feature, triggering stacks will be locked and the remaining reels will spin. If you land additional adjacent matching stacks, you’ll receive an additional spin. During each Re-Spin, the Mystery Stacks will change to match the symbols in the triggering stacks.